Each week, we’ll examine two players that have gone in opposite directions in the past week previous week and their prospects for the immediate future. Despite constantly facing bigger opponents, Landry's value is soaring. At 6-foot-6, Landry has the honor of being the shortest center* in NBA history. That’s pretty impressive, especially since he’s starting in place of 7-foot-6 Yao Ming. 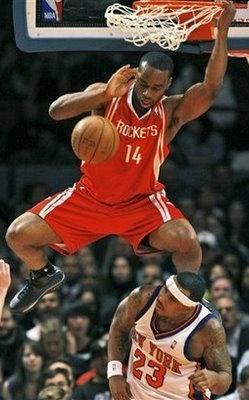 Gradually, Landry has begun to play nearly as well as Yao. Landry is ranked 37th overall in eight-category leagues over the past two weeks, according to Basketball Monster. He’s averaging 18.1 points, 7.0 rebounds, 1.0 block and 0.7 steals per game while shooting .590 from the floor and .875 from the line during that span. Landry has been solid all season but has really been putting it together of late, scoring in double figures in nine straight games. He’s grabbed seven or more rebounds in five of those games and has made more than half of his shots in all but two. The Rockets have a tremendous way of getting a lot of production from players who aren’t flashy. They are the anti-Warriors. I’m not quite sure Landry can maintain his current rate of blocking 1.3 shots per 36 minutes, which is helping his value tremendously. But his high-percentage scoring and rebounding are legitimate. Let’s just hope Yao doesn’t come back this season. * For some reason, Landry is not yet center-eligible in Yahoo! leagues … yet. Indeed, Ginobili has looked a step slow this season. He’s averaging just 11.6 points and 2.4 assists in five games since returning from injury, shooting 37 percent from the floor during that stretch. Manu has added 1.6 3-pointers and 1.6 steals, so it hasn’t been a total loss. But it was shaky even before the injury for the player that landed 29th overall in the preseason projections (and that was INCLUDING 15 projected games missed). But now is definitely the time to buy low on Ginobili. San Antonio is actually out of the playoff picture right now, one game behind the eighth-place Oklahoma City Thunder in the Western Conference. The Spurs need Ginobili to be one of the best players in the NBA and it’s starting to show as his minutes have already started creeping towards 30 per game. I’m trying two-for-one offers to grab Ginobili in nearly every league I’m in.